Place bacon on a plate; cover with a paper towel. Microwave 2 to 3 minutes or until crisp; drain. Heat a medium skillet over medium heat. Drizzle a little vegetable or olive oil into the hot pan. Slice donut in half; use a cookie or biscuit cutter to cut a larger hole in the center of the top half. Place both donut halves, cut side down, in hot skillet. Crack an egg in the center of the larger donut hole (the top half). Cover immediately and let cook until the egg is set and white on the top, about 3 to 4 minutes. Flip bottom donut half upright and place on a serving plate. Top with cheese slice and bacon. Top with remaining donut half/fried egg. Serve immediately. I can’t believe I’m writing this, you guys. I just can’t believe it. It can’t be true. It musn’t be. But it totally is. 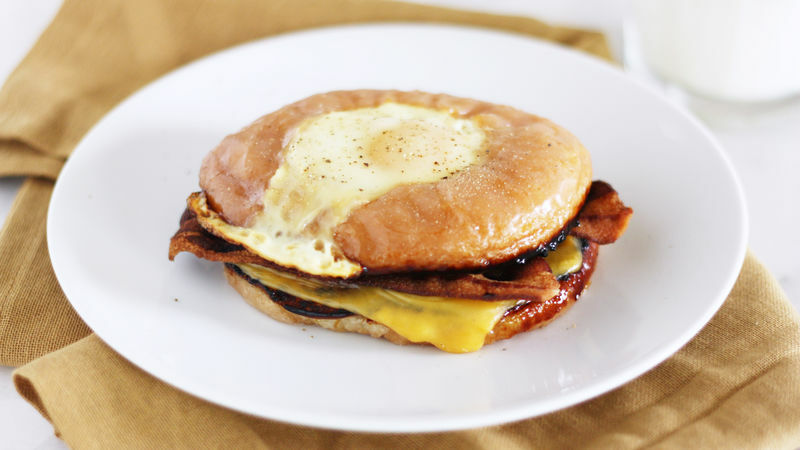 I made a breakfast sandwich out of a doughnut…and I liked it. I MEAN…look at this thing. How can you not? When you’ve got a perfectly cakey glazed doughnut with a fried egg in the middle and melty cheese and crispy bacon in the center, it’s hard to resist. Impossible, even. So now I’m going to show you how to make it – so you can have one yourself. Because, fried egg donut breakfast sandwich, friends – I needn’t say more. Here are the four things you need to make this sandwich. Just four ingredients and you’re on your way to Breakfast Sandwich Magictown. If that alone doesn’t convince you to go forth and make this recipe, I don’t know what will! Cut the doughnut in half, then cut a larger hole in the top half of the doughnut. This is where the egg will go, and it needs a little bit more room so it can cook through. Place both doughnut halves glazed-side up on a hot, lightly oiled skillet. Drop an egg into the center of the now-larger doughnut hole, like so. Cover the skillet immediately so the egg can cook through and turn white on the top. When the egg is set, remove the doughnut halves from the skillet and place them on a plate, with a slice of American cheese and two slices of crisp, cooked bacon sandwiched in the middle. Good heavens, that looks good! But it looks even better when you do this. Breakfast Sandwich Magictown, I like you. I like you a whole lot. Stephanie (aka Girl Versus Dough) needs a nap after eating this thing. Check out Stephanie’s Tablespoon member profile and keep checking back for her own personal recipes on Tablespoon!